Bronchodilation occurs over the serum theophylline concentration range of 5 to 20 mcg/mL. Clinically important improvement in symptom control has been found in most studies to require peak serum theophylline concentrations > 10 mcg/mL, but patients with mild disease may benefit from lower concentrations. At serum theophylline concentrations > 20 mcg/mL, both the frequency and severity of adverse reactions increase. In general, maintaining peak serum theophylline concentrations between 10 and 15 mcg/mL will achieve most of the drug’s potential therapeutic benefit while minimizing the risk of serious adverse events. ††Reported range or estimated range (mean ± 2 SD) where actual range not reported. †NR = not reported or not reported in a comparable format. In patients with chronic asthma, including patients with severe asthma requiring inhaled corticosteroids or alternate-day oral corticosteroids, many clinical studies have shown that theophylline decreases the frequency and severity of symptoms, including nocturnal exacerbations, and decreases the “as needed” use of inhaled beta-2 agonists. 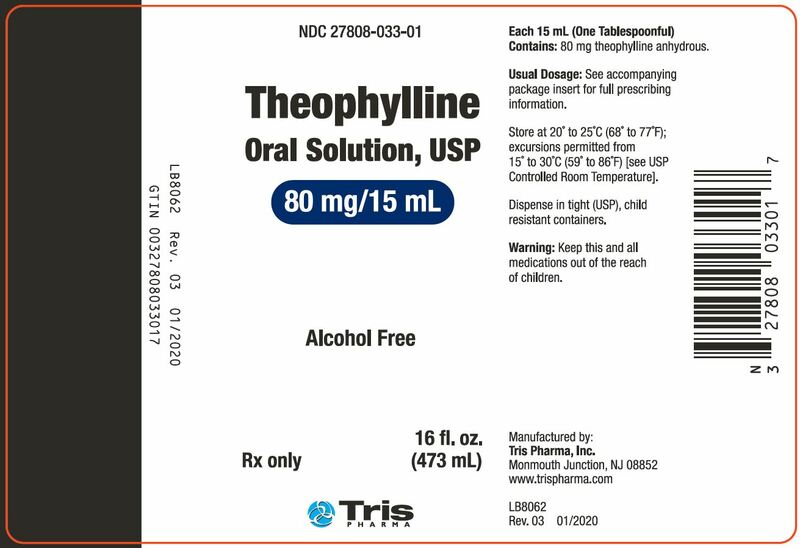 Theophylline has also been shown to reduce the need for short courses of daily oral prednisone to relieve exacerbations of airway obstruction that are unresponsive to bronchodilators in asthmatics. Careful consideration of the various interacting drugs and physiologic conditions that can alter theophylline clearance and require dosage adjustment should occur prior to initiation of theophylline therapy, prior to increases in theophylline dose, and during follow up (see WARNINGS). The dose of theophylline selected for initiation of therapy should be low and, if tolerated, increased slowly over a period of a week or longer with the final dose guided by monitoring serum theophylline concentrations and the patient’s clinical response (see DOSAGE AND ADMINISTRATION, Table V). Whenever there is a new illness, worsening of a chronic illness or a change in the patient’s treatment regimen that may alter theophylline clearance (e.g., fever >102°F sustained for ≥24 hours, hepatitis, or drugs listed in Table II are added or discontinued). As a result of its pharmacological effects, theophylline at serum concentrations within the 10 to 20 mcg/mL range modestly increases plasma glucose (from a mean of 88 mg% to 98 mg%), uric acid (from a mean of 4 mg/dl to 6 mg/dl), free fatty acids (from a mean of 451 µЄq/l to 800 µЄq/l, total cholesterol (from a mean of 140 to 160 mg/dl), HDL (from a mean of 36 to 50 mg/dl), HDL/LDL ratio (from a mean of 0.5 to 0.7), and urinary free cortisol excretion (from a mean of 44 to 63 mcg/24 hr). Theophylline at serum concentrations within the 10 to 20 mcg/mL range may also transiently decrease serum concentrations of triiodothyronine (144 before, 131 after one week and 142 ng/dl after 4 weeks of theophylline). The clinical importance of these changes should be weighed against the potential therapeutic benefit of theophylline in individual patients. The drugs listed in Table II have the potential to produce clinically significant pharmacodynamic or pharmacokinetic interactions with theophylline. The information in the “Effect” column of Table II assumes that the interacting drug is being added to a steady-state theophylline regimen. If theophylline is being initiated in a patient who is already taking a drug that inhibits theophylline clearance (e.g., cimetidine, erythromycin), the dose of theophylline required to achieve a therapeutic serum theophylline concentration will be smaller. Conversely, if theophylline is being initiated in a patient who is already taking a drug that enhances theophylline clearance (e.g., rifampin), the dose of theophylline required to achieve a therapeutic serum theophylline concentration will be larger. Discontinuation of a concomitant drug that increases theophylline clearance will result in accumulation of theophylline to potentially toxic levels, unless the theophylline dose is appropriately reduced. Discontinuation of a concomitant drug that inhibits theophylline clearance will result in decreased serum theophylline concentrations, unless the theophylline dose is appropriately increased. Other adverse reactions that have been reported at serum theophylline concentrations <20 mcg/mL include diarrhea, irritability, restlessness, fine skeletal muscle tremors, and transient diuresis. In patients with hypoxia secondary to COPD, multifocal atrial tachycardia and flutter have been reported at serum theophylline concentrations ≥15 mcg/mL. There have been a few isolated reports of seizures at serum theophylline concentrations <20 mcg/mL in patients with an underlying neurological disease or in elderly patients. The occurrence of seizures in elderly patients with serum theophylline concentrations <20 mcg/mL may be secondary to decreased protein binding resulting in a larger proportion of the total serum theophylline concentration in the pharmacologically active unbound form. The clinical characteristics of the seizures reported in patients with serum theophylline concentrations <20 mcg/mL have generally been milder than seizures associated with excessive serum theophylline concentrations resulting from an overdose (i.e., they have generally been transient, often stopped without anticonvulsant therapy, and did not result in neurological residual). The chronicity and pattern of theophylline overdosage significantly influences clinical manifestations of toxicity, management and outcome. There are two common presentations: (1) acute overdose, i.e., ingestion of a single large excessive dose (>10 mg/kg) as occurs in the context of an attempted suicide or isolated medication error, and (2) chronic overdosage, i.e., ingestion of repeated doses that are excessive for the patient’s rate of theophylline clearance. The most common causes of chronic theophylline overdosage include patient or care giver error in dosing, clinician prescribing of an excessive dose or a normal dose in the presence of factors known to decrease the rate of theophylline clearance, and increasing the dose in response to an exacerbation of symptoms without first measuring the serum theophylline concentration to determine whether a dose increase is safe. Several studies have described the clinical manifestations of theophylline overdose and attempted to determine the factors that predict life-threatening toxicity. In general, patients who experience an acute overdose are less likely to experience seizures than patients who have experienced a chronic overdosage, unless the peak serum theophylline concentration is >100 mcg/mL. After a chronic overdosage, generalized seizures, life-threatening cardiac arrhythmias, and death may occur at serum theophylline concentrations >30 mcg/mL. The severity of toxicity after chronic overdosage is more strongly correlated with the patient’s age than the peak serum theophylline concentration; patients >60 years are at the greatest risk for severe toxicity and mortality after a chronic overdosage. Pre-existing or concurrent disease may also significantly increase the susceptibility of a patient to a particular toxic manifestation, e.g., patients with neurologic disorders have an increased risk of seizures and patients with cardiac disease have an increased risk of cardiac arrhythmias for a given serum theophylline concentration compared to patients without the underlying disease. Anticipate Need for Anticonvulsants In patients with theophylline overdose who are at high risk for theophylline-induced seizures, e.g., patients with acute overdoses and serum theophylline concentrations >100 mcg/mL or chronic overdosage in patients >60 years of age with serum theophylline concentrations >30 mcg/mL, the need for anticonvulsant therapy should be anticipated. A benzodiazepine such as diazepam should be drawn into a syringe and kept at the patient’s bedside and medical personnel qualified to treat seizures should be immediately available. In selected patients at high risk for theophylline-induced seizures, consideration should be given to the administration of prophylactic anticonvulsant therapy. Situations where prophylactic anticonvulsant therapy should be considered in high risk patients include anticipated delays in instituting methods for extracorporeal removal of theophylline (e.g., transfer of a high risk patient from one health care facility to another for extracorporeal removal) and clinical circumstances that significantly interfere with efforts to enhance theophylline clearance (e.g., a neonate where dialysis may not be technically feasible or a patient with vomiting unresponsive to antiemetics who is unable to tolerate multiple-dose oral activated charcoal). In animal studies, prophylactic administration of phenobarbital, but not phenytoin, has been shown to delay the onset of theophylline-induced generalized seizures and to increase the dose of theophylline required to induce seizures (i.e., markedly increases the LD50). Although there are no controlled studies in humans, a loading dose of intravenous phenobarbital (20 mg/kg infused over 60 minutes) may delay or prevent life-threatening seizures in high risk patients while efforts to enhance theophylline clearance are continued. Phenobarbital may cause respiratory depression, particularly in elderly patients and patients with COPD.